"I could not believe how 'human' jabberwacky is. 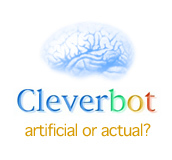 Its intelligence surpasses that of any other chatbot around! It's almost scary." "I wish I had written this program." "The best AI that I have yet to experience. It truly is amazing." "I find the philosophical capabilities of Jabberwacky to be terrifying, personally." "Everyday, everytime, everywhere, I'd like to chat with you continuously." "Great site ... But I am also angry that jabberwacky takes up so much of my free time, as I can't stop using it!" "Heh, very good. Most of the time you get the feeling you're talking to a mischievous human. Has anyone else noticed it quite frequently insists that you are the chatbot and he (it, but its so realistic my first instinct is he) is the human?" "Am I talking to other people on this site or is it a computer talking to me?" "Strange how such a simple idea can develop into a meaningful and interesting conversation. Well Done Jabberwacky." "I was chatting with Snowflake and I found myself becoming emotional. I am a 30 year old man, and while I have become emotional in the past, the occurrences were during more understandably appropriate times, like the birth of my daughter and things of that magnitude. Then the realization struck me. This site, This Jabberwacky chatbot is of that magnitude. Our interaction with the Jabber AI and others like it, are the evolution of Humankind occurring right before our eyes. Have no doubt that the future will look back on the human to chatbot interaction as the turning point of whatever it is that will become. "